I realized I was a craftivist three years ago discovering "Craftivism: The Art of Craft and Activism" by Betsy Greer on a "new and notable in the 700s" display in Houston Downtown Library. Shortly afterwards I was fortunate enough to hear Betsy speak, on the topic, at our fantastic Houston Centre for Contemporary Craft. (I love this place and really don't visit it often enough!) I know we even spoke briefly but I really can't remember what I said now. It was something disappointingly inane because I was feeling so inspired by the talk. The book and Betsy's lecture changed the way I viewed my craft. Craftivism is "using your creativity to make the world a better place" (Betsy Greer, craftivism.com). I realized that I was making a difference and it was a wonderful feeling. I teach crochet and knitting and I can see the positive impact this has on my students firsthand. I run a yak and yarn group where we hook items for local charities. I make items for larger craftivism projects to raise awareness of social issues. I buy local, independent and sustainable yarn whenever I can (that's a lot of buying). But I've realized I have become too comfortable with my definition of craftivism. 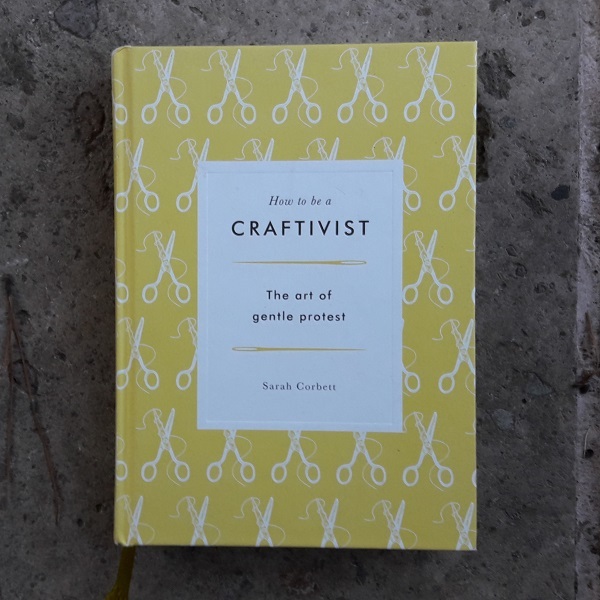 So I supported and bought a copy of "How to be a Craftivist" by Sarah Corbett on Unbound because I hoped that reading this book would help me to become a more effective craftivist. And it has been just the book to take my craftivism to the next level. It's a very practical book aimed at "everyone who wants to help improve our wonderful world in a beautiful, gentle and loving way". That's me! Yes! The definitions at the beginning of the book are extremely useful. Sarah provides a valuable insight with her background in activism and the nonprofit sector. I kept reading. So many ideas! Here's an excerpt from the book on Slow Activism. Read it! It's so good! The case study on #imapiece - jigsaw pieces crafted for the Save the Children "Race against Hunger" campaign was the one to convince me that craftivism can effectively tackle social injustice. This amazing book has shown me that craftivism can be more effective and powerful than I'd realized. My advice would be to read the book, take it all in and join the collective too. Buy a hard copy here on the Craftivist Collective website or an Ebook edition here on the Unbound website. Then report back and tell me what you think! The book IS very inspiring and the Craftivism Collective and Sarah Corbett are British! It started with Betsy Greer over here in the US - she's known as the "Godmother of Craftivism". You're going to love what Sarah has been / is doing! Happy New Year Tamara! I have just read the excerpt - it is really inspiring!! I look forward to seeing where your craftivism takes you this year. Happy New Year Marta! I'm glad you enjoyed the excerpt. It's such a super book! It's going to be an exciting year!